Doing all of that for you. Are you gonna take the wrath? The one I called upon. Less is not the number I want on. I go back and forth with how much I post on my Facebook. One of the things that I like to do in response to negativity, complaining, or even overshare of personal things..is to post encouraging and challenging thoughts. I posted this last night. The biggest difference between joy and happiness. Happiness is temporal based on uncertain circumstances. As long as “this or that” is good I am happy. Joy is eternal and not limited to the present circumstance. Joy is having God’s perspective while uncertain things take place. Joy is having an umbrella and also trusting that without one you will still make it through the storm. Mathew 5:45.. and sends rain on the just and on the unjust. Joy is a internal peace that will enable us to stand in dark, troublesome, and even fearful events. Joy is evidence that you are trusting in what we don’t see. Joy gets more sentences then happiness because it lasts longer. I don’t have to preface what I am about to say because I can say whatever I want on my own blog. 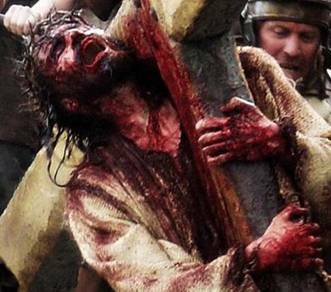 God bless America for this freedom that will be taken away one day by demonic-possessed men and women working for the Anti-Christ all to fulfill God’s great purposes before He comes and slays the heads of every single wicked King on this planet that does not bow before Him..A Jewish man that is the only one worthy to execute justice. So before you think your justice initiatives are really impacting the food ministry at your church does it line up with Christ? Does preaching His Gospel actually go beyond just feeding people and doing good stuff in a church building? God does not dwell in temples made by hands..
My intro is a little bit of a rant but my aim..please, hear me, my aim is not to judge or condemn..I am examining myself and sharing with you what I am staring at when I look at Jared Diehl in the mirror. It is believed that in the Christian life(at least most have some of this going on) that just going to church or activities at church and listening to someone preach on the radio equates to transformation. I do not want to go into all the details of this point because that is a thousand posts to come on the subject of sanctification. Just hearing truth and the concepts of say salvation, justification(saved by faith, not by works), christian ethics, tithing, giving, forgiveness, showing compassion to a dying world, exc..
John Calvin still lives in modern minds today. Calvinism. Neo-Calvinsim. Pelagianism. Mark Driscoll and John Piper–ism(Godly men..not making fun of them) carry the flame of TULIP. Some might add a few more letters. I don’t get all of it but I do agree that Total Depravity is pretty close to bearing its name. It means TOTAL. It means we cannot save ourselves. It means we are not good. It means no one is good. The world is the world I live in and I am the darkness Jesus talks about. I am the resistance to Him. The answer to the pop lyrics is that you can imagine that you are doing what you want. You can imagine that at college your parents don’t know what you are up to unless you put in on facebook which would only break their hearts even more. You can and I can imagine that ‘doing what we want!’ is what makes America so special and so unique and so set apart from all those other communist dictators out there. No, that is the problem. We will answer for our deeds and for our actions and most of all, for our choices. Mercy is to be had and God is beyond good and will forgive anyone for anything, but it is still a choice. And most will choose darkness. I am everything Paul lists just in Romans 3, not to mention all the other places. I am all of those descriptions and more and most likely worse then those descriptions. I have not a very exciting life so its much easier for me to just talk about other people. I guess I am a leader so its okay to break everyone open because I am trying to be a good leader and I am trying to help them. Really? Talking crap about people really helps them. I think giving a quarter for someone to take the bus is doing a good deed for the day while I am mostly thinking about how I can waste more money at Starbucks, or on movies, or on eating crappy food. But because I please everyone and appear to be doing things right by praying at my church and praying loudly on the microphone I guess I am fighting the darkness..right? Sorry to sound negative on myself. I am done beating myself up. 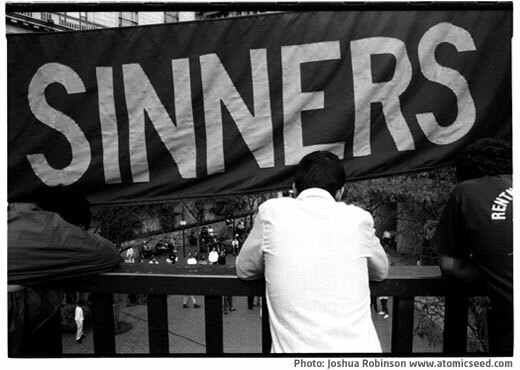 I hope I can find life in God to the point of not just talking about my sin with Him. I hope that is not all we talk about in heaven. Its a work in progress. It is both an error to think we are better then what we really are and call our good deeds godliness when it can not be that. 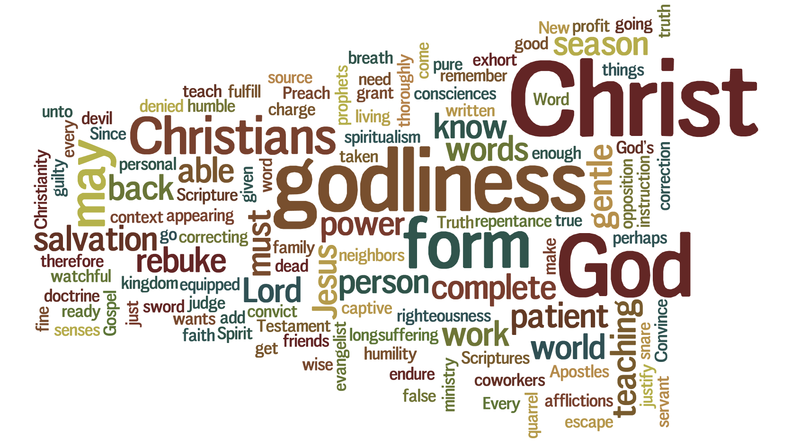 “A form(appearance) of godliness, but denying its power.” I fear that we are getting itching ears. And I am, again, looking at me first. It is much easier for me to believe in a book like ‘Your Best Life Now’ then it would be for me to meditate on Romans 3 and John 3. It would be much easier for me to just feed people at our church’s food ministry and call it making an impact on people or even dare to call it the same thing as love. Love is not food. Love is not stuff. The Gospel is not just for the “blessings” and for a “better life.” Have you read the Declaration of Independence? Have you really believed that we are founded on Godly principles or have some kind of covenant with God because ‘God Bless America’ is the signet phrase on our green money? To my understanding the only covenant nation with God is Israel. I mean Israel in the past and Israel today. So, God so keeps His word that when Israel disobeys God He corrects them by sending the Assyrians, the Chaldeans, and any other surrounding enemy..all for the purpose of correcting them. In Ezekiel alone some 70 times God says, ‘So that they may know that I am the Lord.’ So, covenant with God looks like that. I am pretty sure Russia or North Korea or China have not invaded the shores of America. But is is surely possible if we want to make that kind of commitment back to God. It hurts to be honest. And the bad news is that we are in danger. We are in grave danger as a country if we think our prosperity means God is for the things we do as a nation. I don’t want to bash America. And God does love us and loves the 300 plus million people who live here..but its still bad news before the good news that we need to hear. Our American Dream is dying. Thanks Adam Smith for breaking it down for us, but it doesn’t take an expert sociologist to say that it is dying. I can’t speak for everyone because I have had a pretty easy life. Yes, my dad was not the best father and my mom stayed with him for much to long and now I have bipolar depression partly because of the abusive home life we had. But no one would have ever guessed that because we went to a charismatic church that loved intercession. Again, that didn’t change the pain, or the genetic disposition I have, or the negative lies that have warped my mind that now..as a man I have to face so I don’t screw my kids up. And I love my parents. I still love my dad and my mom and without them I would be way far off doing God knows what. I honor them. I am simply saying that our past is not just buried because ‘all things have become new.’ I hope you understand. We have pain. Life is hard and I don’t really know what else I have experienced that would put me in a place to hate God because God is not the problem and not the source of the world’s suffering and injustice. He has given us a choice and the choice is ours to now..in spite of our darkness to live lives of humility and choose what is right over what is evil and wrong. The challenge for us us to make the Ruckus. To make the noise about what is good and who it comes from. Good is from above. ‘Every good and perfect gift.’ ‘God cannot deny Himself’ and that means that He will not compromise any part of Himself. He will always make the perfect choice. If I end up in Hell then He did everything possible for me to not go there. He will be right. I feel no condemnation. I feel it would help us to evaluate with the word of God and not by the church culture or the culture in general. We are the light. We are the salt. We are not to hide from the world. We are to shine in it. Based on a conversation I had when I was in Denver, Colorado in August of 2007. Reflecting on hearing God. 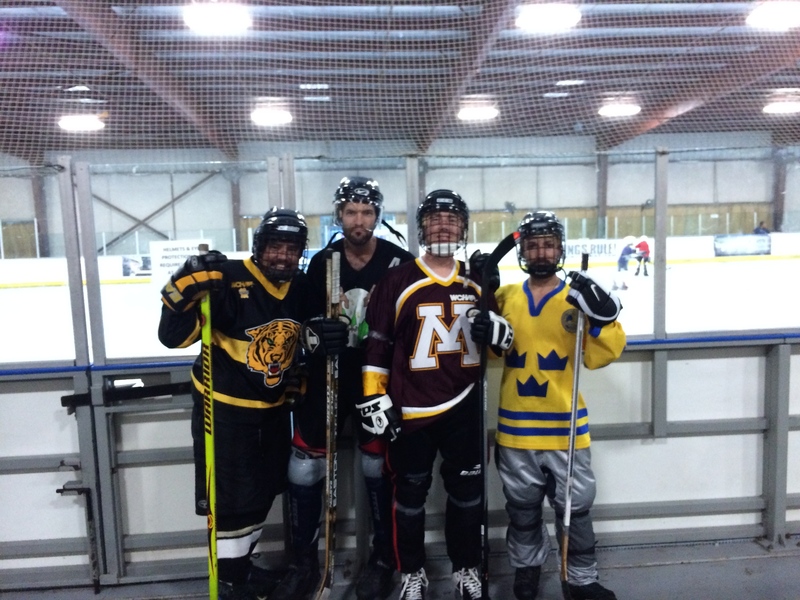 For the past two months we have been playing inline hockey on Thursday nights. All four of us(Team Kneeon Tiger) have only played one other time together. Tonight was our second time. Hockey brings up so many thoughts of joy and gratitude. I played ice hockey for six years straight from 10-16 and back in 2008 I got back into it in Kansas City. Here I am in 2014 still playing. We got to pray for this guy named Mo tonight. Its amazing to be a light in a dark place. Here’s a reflection on it. I am honoring my mom as well who is the ultimate evangelistic example. She uses her job daily to preach the Gospel. Also dedicated to my dad for all those wonderful years of playing. Two summers ago I was having this sensation of friends changing and seasons changing. I just equated it to driving down a road for a long time and the passengers staying interested in you and how that can be true in life too. What others think will never come close to knowing what God thinks. Here’s the reflection.